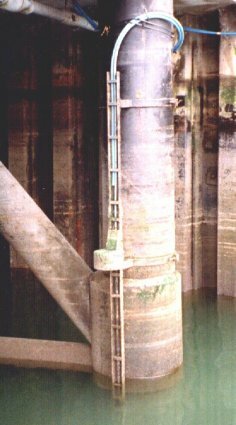 The operation of the mid-tide bubbler is similar to that of the full tide system, except that the measuring point is mounted at the mid tide height. That means that the pressure point is only immersed for half of the tidal cycle. The reason for this, is that when the measuring point is exposed as in the photograph opposite it can be accurately levelled into the geodetic network. Once this is accomplished the full tide pressure points can be fitted to match the tidal curve produced by the mid tide pressure point, thereby connecting them to the geodetic network.